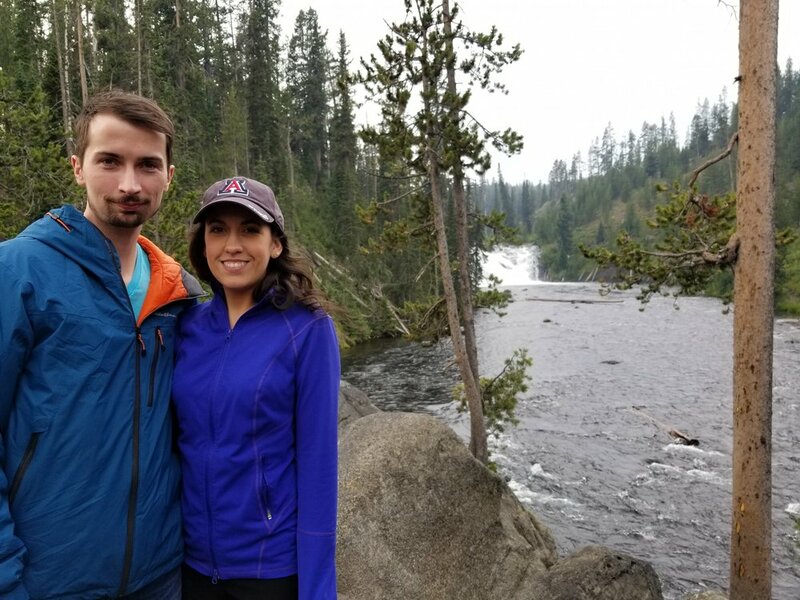 My wife and I helped my sister move from the lower forty eight to Anchorage, Alaska in early August 2018. Departing Salt Lake City and meeting in Yellowstone, we took a scenic drive through Glacier, Banff and Jasper National Parks, Grand Prairie, Muncho Provincial Park, and Whitehorse before finally making it to Anchorage on day nine. After sticking around for three days, we flew home late on day twelve marking the end to a whirlwind journey. 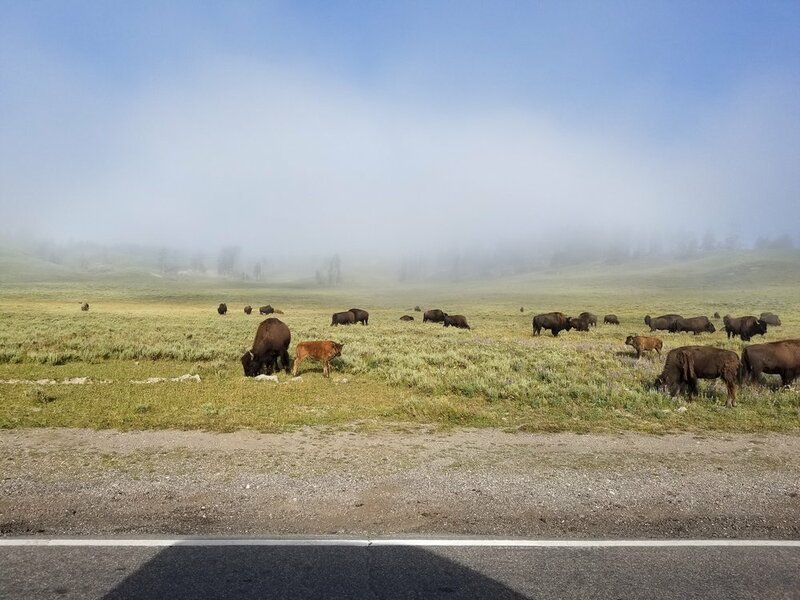 This was a phenomenal journey that took months of planning, particularly in securing camping reservations at the wildly popular Yellowstone and Banff National Parks. We learned a lot and while we are absolutely glad that we helped this move and took part in seeing some of the most popular nature reserves in the world, we had a lot of lessons and mistakes that warranted sharing. If seeing the map above, with its curvature of the freaking Earth, isn't enough to sink in the scope and severity of this trip, then the drive time/cost comparison graphic below should do the trick. The graphic below accounts for expendables (e.g. 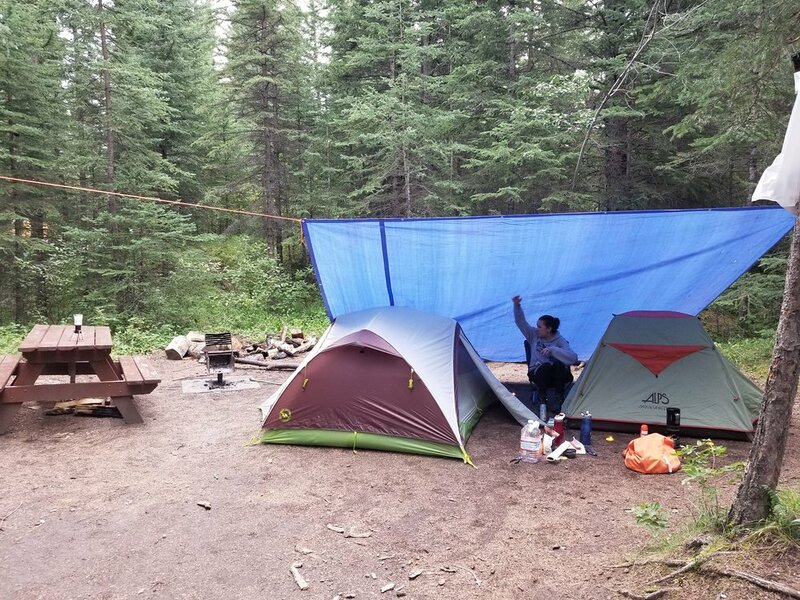 food, toiletries, firewood), reservations, gas, and our return flight; it does not account for camping gear that we utilized or any other capital expenses. Right off the bat you can see that we back loaded our driving and for good reason; there isn't much between Grand Prairie, Alberta, and Anchorage, Alaska. 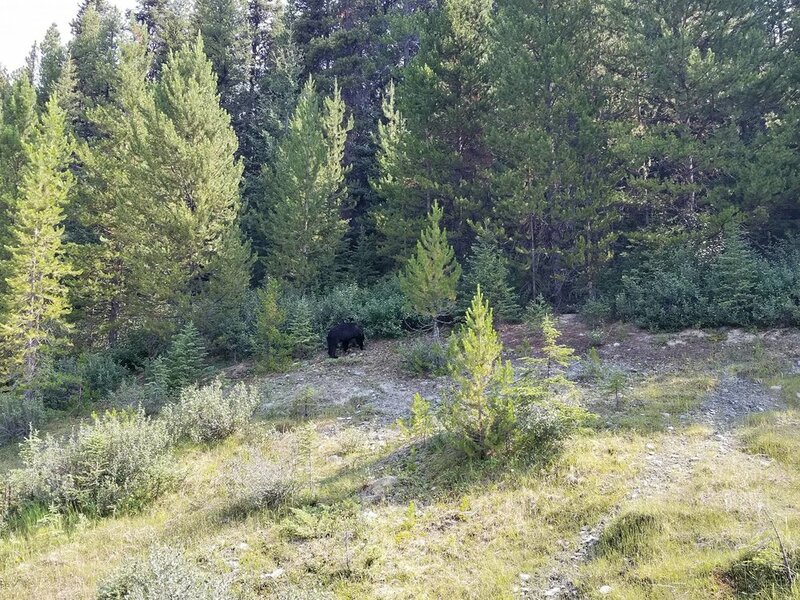 For starters, it's bear country (legitimate, you'll encounter a bear here, bear country) and second the campsites are infrequent and first-come/first-serve basis. If you're looking to experience more of the northern portion of the trip, The Milepost can help you plan this, but it was simply more than we were willing and able to do. Our trip was, quite simply, a "Greatest Hits" trip of the Alaskan Highway. "Greatest Hits" or no, we required some camping gear to make this work. Consisting of two military-sized duffle bags on the way up and one on the return flight down, our gear was pretty exhaustive and consisted of some backpacking-quality items to help keep weight and volume down. A tarp or two to act as an outdoor awning to provide protection from rain and sunshine. We were able to get reservations for everywhere we wanted to go, but we were fairly lucky. 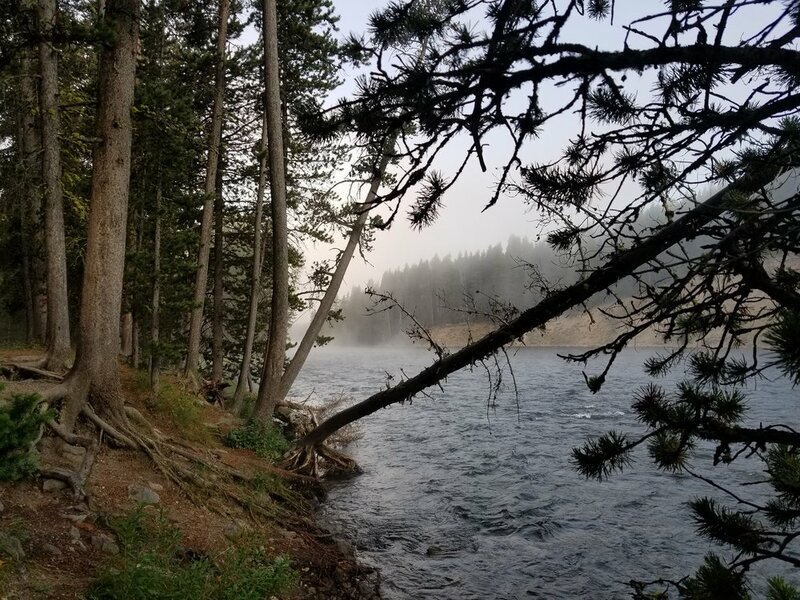 In spite of starting the processes 6 months early, many of the popular campsites in both Yellowstone and Banff were already sold out so our adventure was essentially revived purely through dogged determination and pilfering the ashes of failed vacations and abrupt cancellations; so start this process early. Easily our favorite part of the trip was Yellowstone, and its energetic but mostly forgettable little brother: The Grand Tetons. These parks consisted of a lot of driving, they are massive, with numerous pullouts for trails and scenic vistas that provided the meat of the experience here. We didn't hike a whole lot here (the hike I wanted to do, Uncle Tom's Trail, is hopeless behind its renovation schedule) and we stayed at Bridge Bay Campground. It's worth noting that, for whatever reason, searching "Yellowstone Weather" either provides weather for West Yellowstone or campgrounds at a lower elevation, which left us a little underprepared for the cold nights we ended up facing. While we obviously didn't perish, we did end up starting our mornings a lot earlier than the normal crowd as a direct result of our fitful sleep which, fortunately, made us a lot more likely to see wildlife: 2 Black Bears, 1 Grizzly, 1 Fox, 100s of Bison, and a couple of Elk. Ultimately, I can take or leave the Grand Teton National Park, but Yellowstone is one of the three places I have a desire and a capability of returning to in the near future. The parks were magnificent and spending a week here inlieu of trapsing across Western Canada sounds like a perfect vacation for 2019 or 2020. After finishing our time in Yellowstone we headed north to Whitefish, Montana to stay at the Grouse Mountain Lodge; easily our most expensive night of lodging. The lodge was clearly basking in a high number of tourists seeking something a little more "national park" and a little less "small Montana town," resulting in a touristy and overpriced venue. It's worth mentioning that "overpriced" doesn't equate to "bad" because the Mountain Lodge was far from it; we loved it, but we realistically probably couldn't afford to spend more than a night or two there. After a night of repacking gear, consolidating cars, drinking and showering, we headed to Calgary, Alberta through the Going to the Sun Road. It would be silly to suggest that this scenic road is all that Glacier National Park has to offer, but it was clearly the biggest attraction and we're on a "The Greatest Hits" road trip. Looking to get the most out of our hotel we checked out pretty late (9 AM) and didn't make it on the road until 10; this was a mistake. Unbeknownst to us, the Going to the Sun Road had a significant amount of construction taking place along its more scenic vistas resulting in reduced parking to meet a height-of-the-seasons crowd; get there early. Our trip into both Alaska and Canada went off without any issues and minimal preparatory research on our end. Take an hour or so and read through the first page of Google for "entering Canada" or "Camping in Canada" and you'll more than likely be OK.
Bears. (Beets. Battlestar Gallactica.) So many bears. 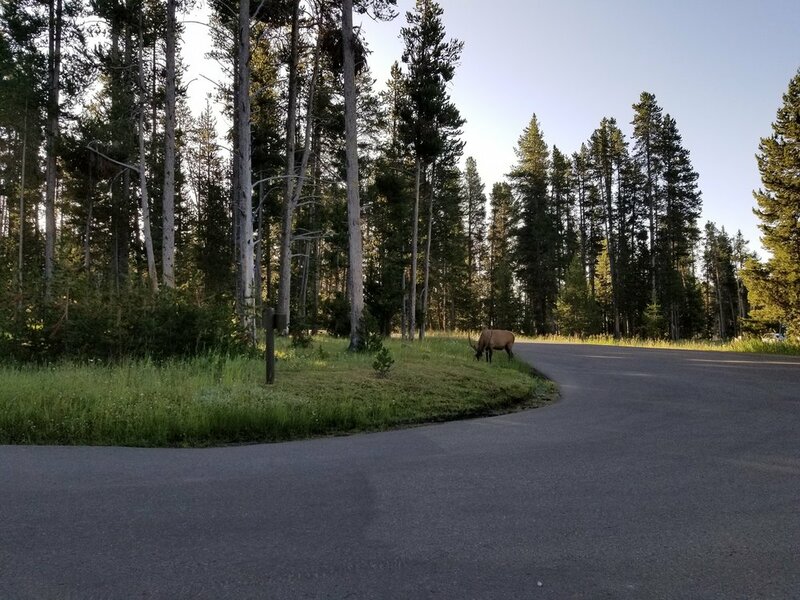 Fortunately they're mostly black bears and they behave a lot like deer (suicidal dashes across busy highways), but it was a bit of a new experience for us Utahn and Arkansan folk. That said, from the time you enter Banff National Park, Alberta to the time you reach Anchorage, Alaska you are in a mountainous forest with seemingly no end. That seemingly homogeneous ecosystem leads me to the largest issue I had with the way we planned our trip: We would have loved to spend two days in Banff and zero in Jasper. Our experience in Jasper was derailed from the beginning: "scattered thunderstorms" at that elevation apparently equates to dime sized hail, the campsites that are apparently front country and serviced have poor availability, are untended, and are essentially only marginally better than back country. While we have done limited back country excursions, we were always prepared to do them and, more importantly, did them without camping fees. The Pocahontas Campground was plagued with bathroom issues, a rude and unhelpful staff, standing water, and mosquitoes from hell (bad even in Alberta standards). Banff, by comparison, had a more Yellowstone feel to it, but with different and (in my opinion) better attractions. We actually had scattered thunderstorms with 20 mile per hour winds and lightning bright enough to illuminate the outline of the tent through a sleeping mask, but the bad weather did little to dampen our enjoyment of the park or detract from the Canyon Campground. Unfortunately, our short time table (one day in Banff and one day in Jasper) meant we saw much less of the park than we would have liked, but what we did see begs for a return trip in the coming years. I mentioned at the beginning of the post that the northern three days were pretty bleak; the exception to this was Muncho Lake and the Northern Rockies Lodge. It should be said that the Northern Rockies Lodge sits alongside the lake in a breath taking scene that, quite frankly, is this lodge's only claim to fame. The rooms were mediocre and the main lodge was peppered with passive aggressive signs about buying things to help support a struggling tourism economy, but the views (see below) made it well worth the stop. The crisp mountain air and the significantly lessened crowds (it's 9 hours either way to the nearest city) made this stop nothing short of idyllic; while we'll likely never find ourselves here anytime in the near future, I could have easily had stayed here for a few weeks reading or writing any number of novellas and basking in the frontier landscape and wide open skies. 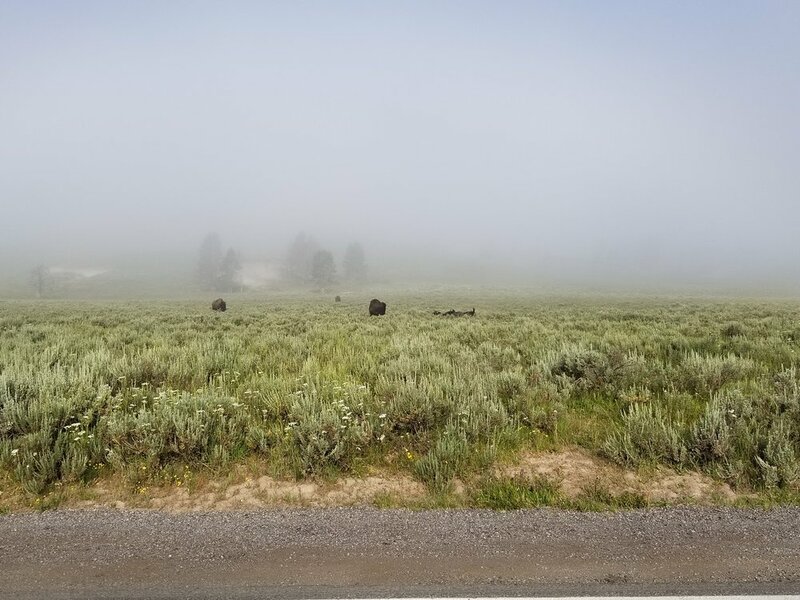 While The Milepost can help plan this section of your journey in more detail, this portion of our trip was mostly marred by long drives, switch back roads, and some massive potholes the size of antelope. A word of caution here: Drive the speed limit; there is nothing more terrifying than being 3 hours into a smooth drive going 20 km/h over and rocking out to some mellow tunes to discover an unmarked pothole the size of a small child that threatens to rip the undercarriage out from under you. The potholes between Whitehorse and Palmer are intense; it's essentially 662 miles of switchbacks, trees, and potholes that will make you see Jesus. Photo Source. Our destination: A late-summer Anchorage, Alaska. Arriving in the midst of the August-September raining season, some of our scenic vistas were obfuscated by an unrelenting cloud cover and ever persistent drizzle, but many of the more breathtaking ones were not. Unfortunately, we didn't get many pictures of these due, in large part, to the relative lack of safety in acquiring them. We drove by Matanuska Glacier on our way into Anchorage from Whitehorse, with some of the most breath taking views I had ever seen in my entire life, but the road conditions, grade, and lack of parking made pictures impossible; you'll have to take our word for it. Winter Alaska has always been at the top of my vacation list, and while it still remains in the top ten (it is nothing like Summer Alaska), viewing the cultural highlights of Anchorage (Namely the Anchorage Museum, Alaska Native Museum, and the Alaska Aviation Museum) helped alleviate some of the insatiable call to explore America's last frontier. For you seafood lovers out there, Summer Alaska has some of the best seafood you'll find anywhere and you coffee lovers will be in absolute paradise with popup coffee shops on virtually every street corner. I've obviously never visited Anchorage in the winter before, but having visited it in the summer I can definitely say it's worth a nonstop flight on Alaskan Air, but maybe not a nine day drive. The drive itself definitely needs to be its own reward and, for us, it mostly was. It was definitely a once-in-a-lifetime opportunity and for that we're fairly fortunate: I'm not sure how much I would want to make the return trip to do it all over; one and done! Sprinkle in a few small long-weekend vacations (via nonstop flights courtesy of Salt Lake International Airport) to Toronto, Vancouver, Calgary/Banff, and Winter Anchorage and I would feel completely comfortable saying "Yeah, we've visited Canada and Alaska." I'm not sure that merely visiting these locations without having experienced the historic Alaska-Canadian (Alcan) highway would have been able to afford us that same experience.